The Royal Chapel is the resting place of the Catholic Kings Ferdinard and Isabel. It is next to the Cathedral. You can go down the narrow stairs and actually see their coffins. The ornate metal railings and altar piece in the Chapel is extremely detailed and grand. 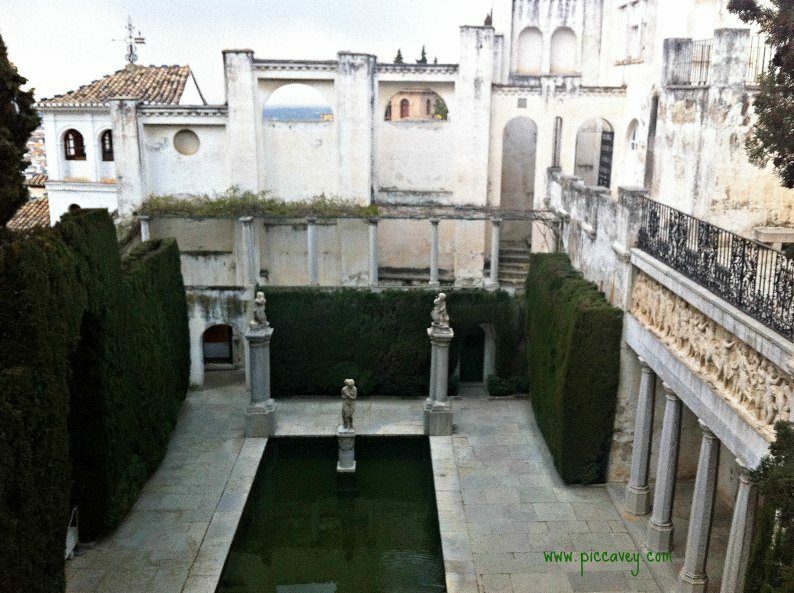 This visit is one of the most popular monuments in Granada. Not only does Granada have the Generalife Gardens in the Alhambra to visit. There are many other stunning locations for greenfingers and peaceseekers. Carmen de los Mártires is one of my personal favourites. Set to one side of the Alhambra Woods, now a public park, there are peacocks strutting around, there are ducks on the lake and many fragrant flowers too. 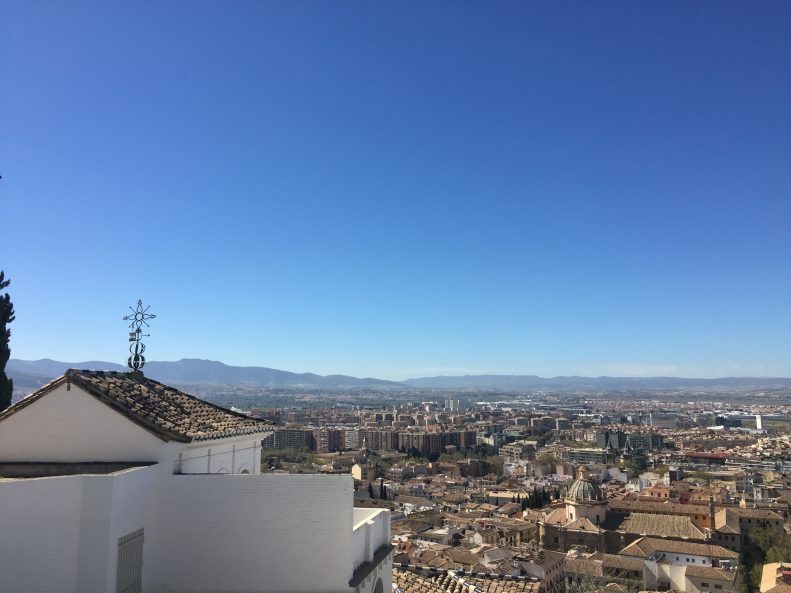 From some areas of the Carmen de los Martires there are wonderful panoramic views of Granada too. The Huerta de San Vicente is a city centre park, and the summer house of Poet F.G.Lorca. This is also a wonderful place to wander around in too. Wander through the Albaicin quarter discovering small squares and stepped streets. The views from here across to the Alhambra and Sierra Nevada are magical. 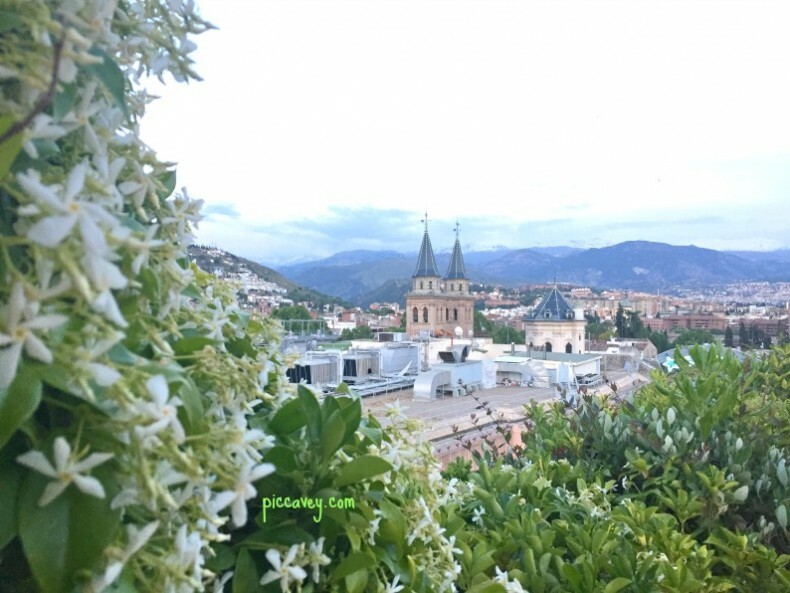 You can also enjoy this area of Granada on the Albaicin Photo Experience guided by a local Professional Photographer, take home memories with you, with fabulous shots of your time in Granada. 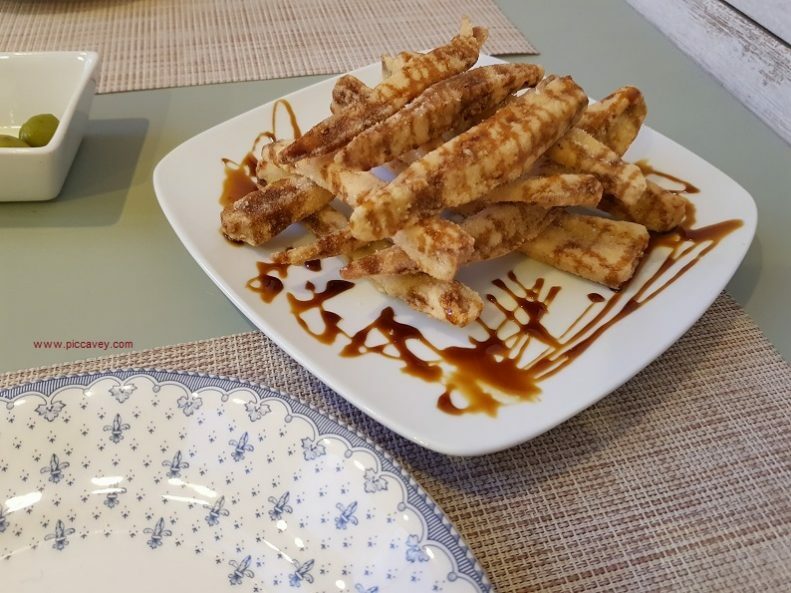 The Taste of Granada Food Tour is a 3 hour tour in the historic centre, focusing on local food. Products grown in the province of Granada are tasted and you also get the chance to buy some to take home if you like. Meet a few local characters along the way and enjoy the seven different gastronomic stops. Feel like a local as you taste you way around the city. This is one of the things to do Granada that most people wish they had done on the first day they arrive. That way they make the most of the insider tips. Located opposite the Royal Chapel, the Madraza is currently owned by Granada University. However you can visit, it costs 2 euros. The top floor has this stunning carved blue woodwork ceiling. On the ground floor there are a small room with wonderful plasterwork engraving. This was the Koranic University in medieval Granada and was the foundation of the current University which we have in the city today. 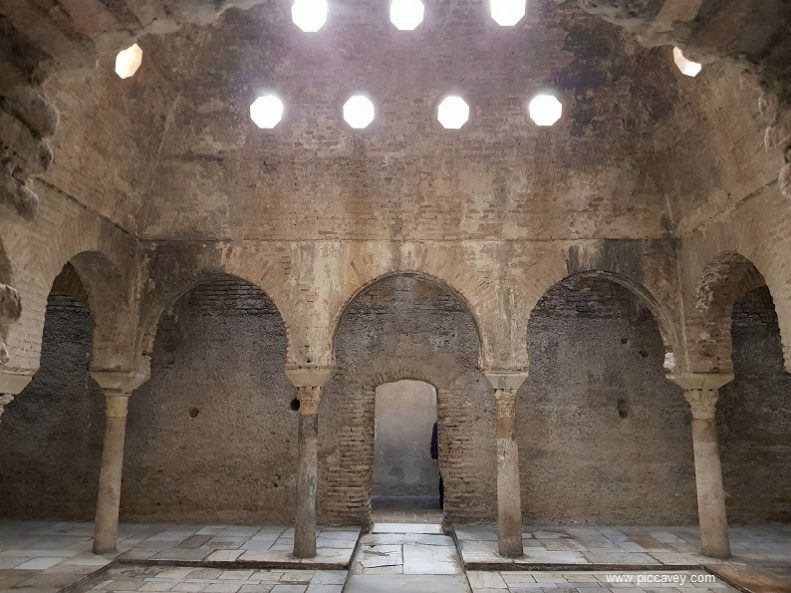 With the legacy of the kingdom of Al Andalus Granada had many Hammam´s or Bathhouses around the city. Today we can enjoy this ritual at one of the modern Bathhouses in the city. There are quite a few offering different services across the city. Depending on your budget and schedule you will be able to find one that suits your travel itinerary. 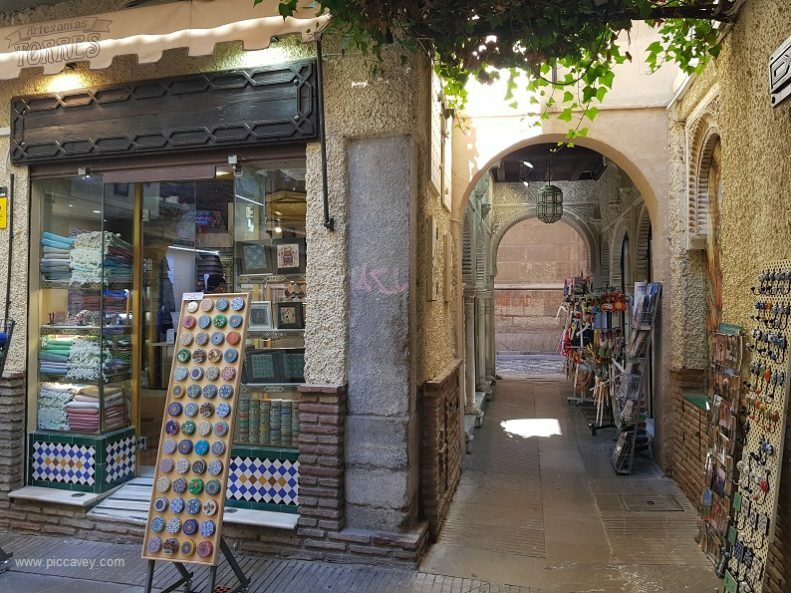 One of the best ways to spend an evening in Granada is to dine at one of the Typical Carmen Restaurants in the Albayzin. With amazing views of the Sierra Nevada and Alhambra Palace this will be a memorable setting. If you manage to time it well, a sunset view will make it even more special. The best way to do this is to go by taxi and book ahead of time. Some get busy especially on weekends. As Granada is surrounded by natural spaces, it makes it a great location for Ramblers and bikers. With trails leaving from the city you can enjoy short hikes and return without a car. 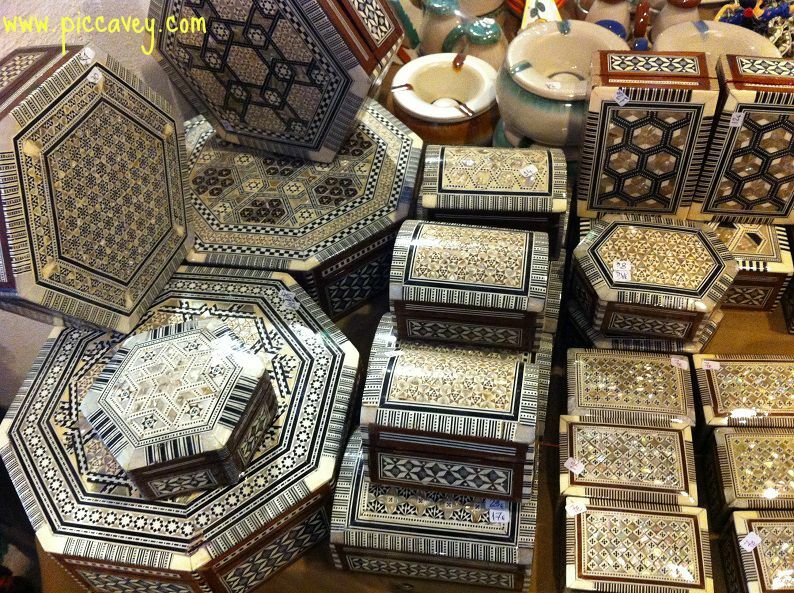 Here is a list of Granada souvenirs to track down when you are in the area. Some of the more typical ideas are Marquetry boxes with wooden inlays and intricate details. Wickerwork baskets and wooden utensils are typical in Andalusia too. Delicately embroidered Andalusian Shawls or colourful Spanish Fans trimmed with lace. 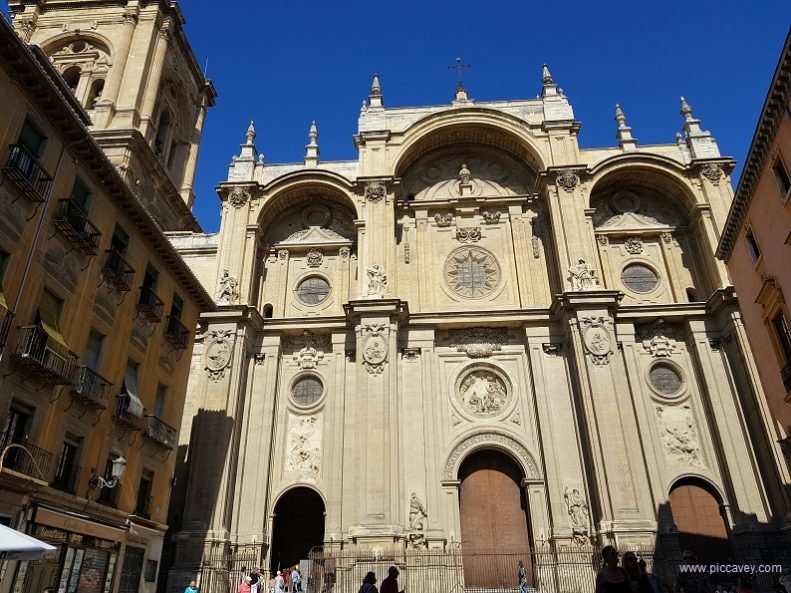 In Granada there are quite a few great examples of Baroque Architecture to see. The Monasterio de la Cartuja is probably one of the best ones to visit. 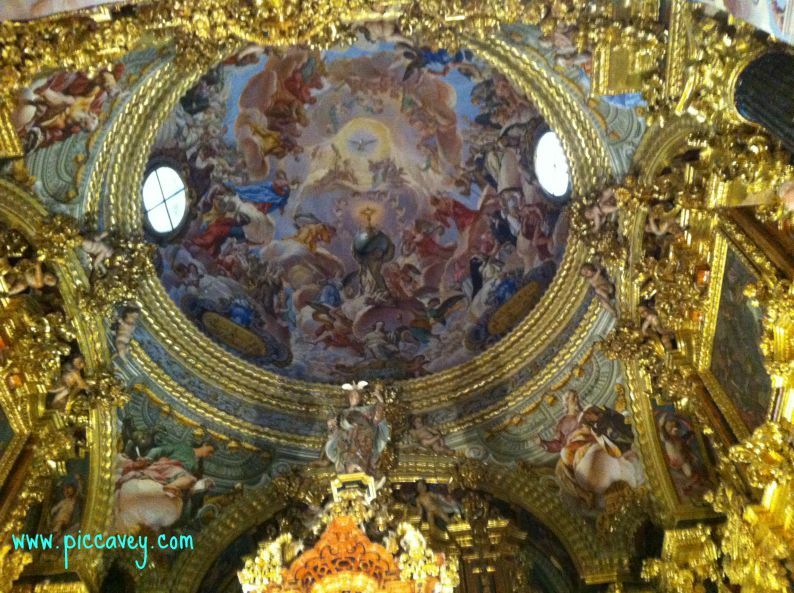 Closer to the city centre is the Basilica de San Juan de Dios which is quite breathtaking inside. 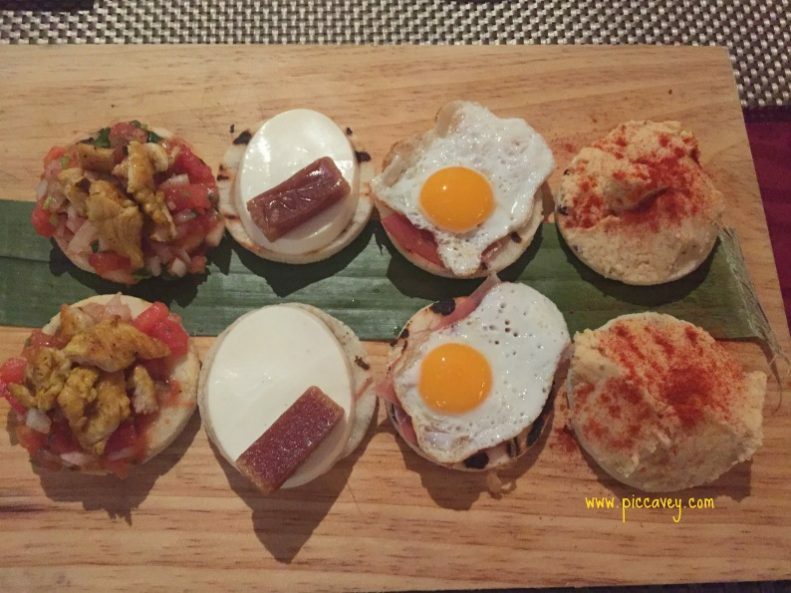 You can´t come to Granada without trying some of the typical Tapas. The Realejo area is my personal favourite. Campo del Principe is a large square with lots of restaurants and bars with outdoor seating across the square. With a lively atmopshere and plenty to choose from this is a good option for warm weather. The Realejo quarter is also decorated with lots of Urban Art too. The Niño de las Pinturas is a local Granada artist who is well known outside Spain for his creations. Wandering around the area along Calle Molinos, Plaza Joe Stummer and Cuesta del Caidero you can see some of the main grafittis. The Church of Virgen de las Angustias on Carrera del Darro is where the Patron of Granada is kept. This Virgen keeps Granada safe from earthquakes. In Autumn the city offers her thousands of flowers to thank her for the protection. If you step into the church when you come to Granada you can see her up high on the main altarpiece. The baroque design of the church interior is very lavish too. All around the Albaicin quarter you can see these curious constructions. 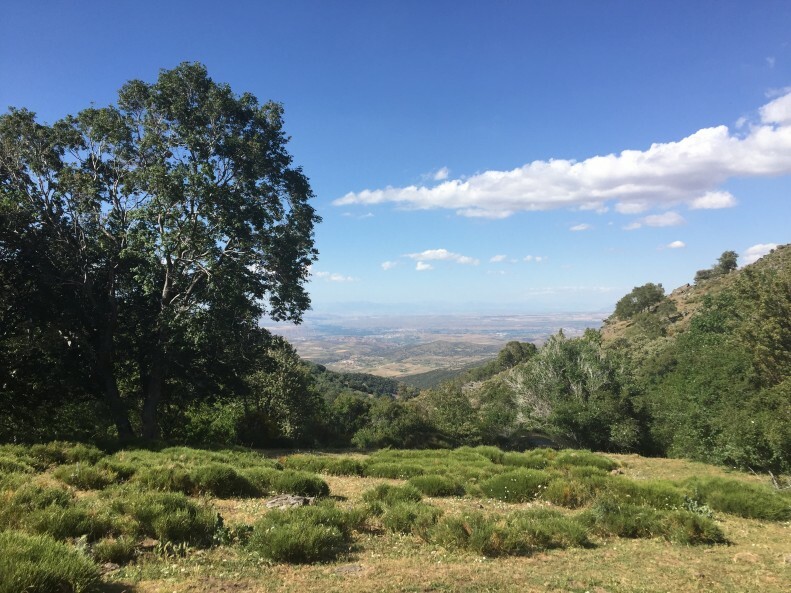 Walk the Aljibes Route to discover the enginnering skills of medieval granada. These cisterns and water tanks were ingenious works to look after the most precious resource in the city. Each group of houses had its own. You can find out more at the Aljibe del Rey too. Granada had an important ceramic tradition. Local craftsmen created the Fajalauza pottery style. Mainly blues and greens with typical symbols such as the pomegrante shape or flourishs like leaves and plants. 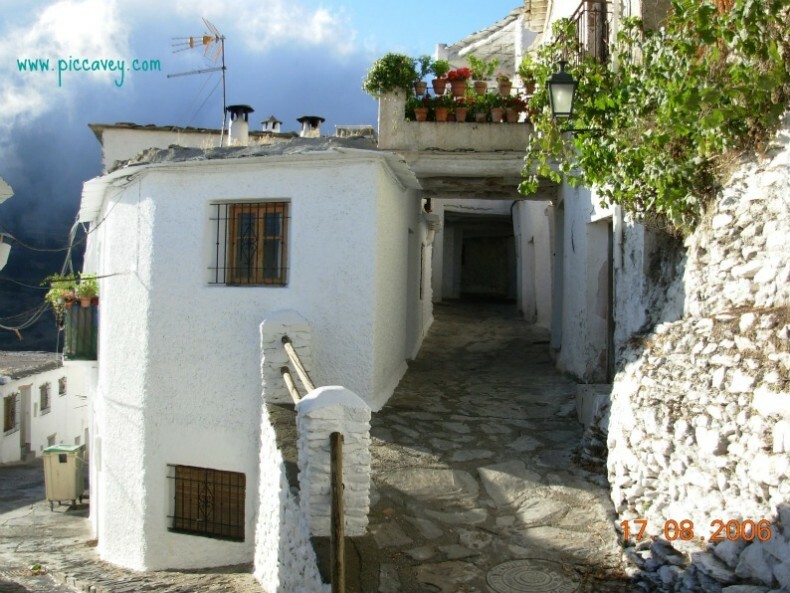 The remote villages of the Alpujarra is my favourite day trip. Discover these berber style houses South of Granada on the side of the Sierra Nevada mountains. You can drive if you are happy to negotiate curvy mountain roads but you will need around 2 hours to get there and back from Granada. This is a long day but worth it to see such unique villages. If you stay overnight it makes the experience much more relaxed and the area is a perfect place to immerse yourself in nature too. Granada in 1997 was quoted to have “the most beautiful sunset in the world” when Bill Clinton visited the city with his wife Hillary & daughter Chelsea. 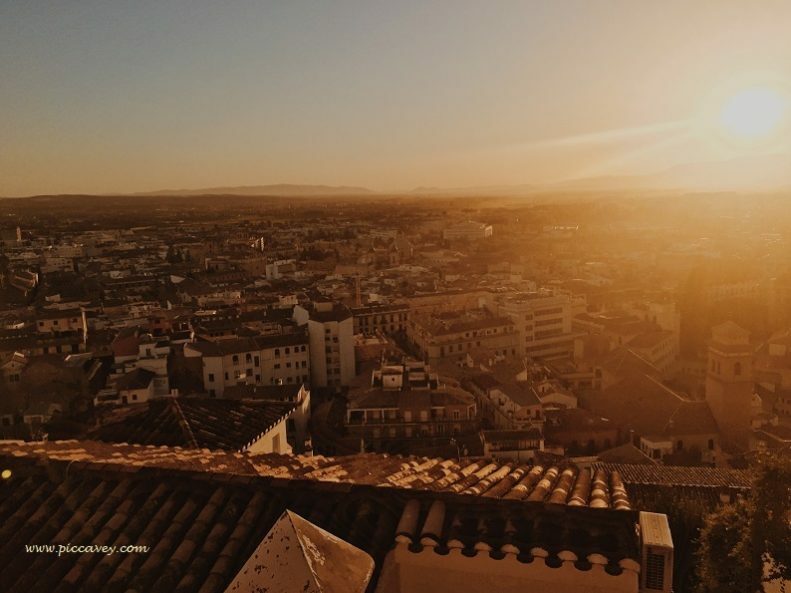 One of the most popular places to see the sunset is the Mirador de San Nicolas in the Albaicin quarter. But it is not the only place. There are many other places to watch the sun go down as the sky turns pinky purple. To see the Sierra Nevada snow turn a delicate pink is one of the best views in Granada wherever you contemplate it from. Mirador de San Cristobal, The Camino de Sacromonte, Carril de la Lona and San Miguel Alto are all worthy spots to set up your tripod too. Some of the best to look out for are: Granada Pinta bien which is Local Art, paintings and Illustrations. or EcoMercado which is usually opoostire Palacio de Congresos on the first weekend of the month. Organic local products are sold in the mornings. 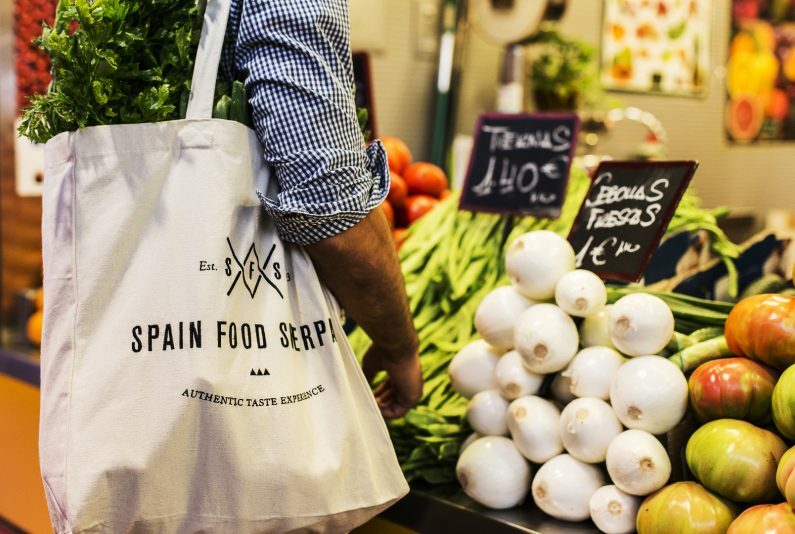 Whether you are looking for Spanish Cooking Classes or Food Tastings of local produce. Since I have been living here over 12 years I know have the local knowledge to recommend the best of local gastronomy. The lesser known Coastline of Granada has plenty to offer. Motril Salobreña or Almuñecar have some great gastronomy, a golf course and good aquatic activities too. Although the beaches are not as sandy as some of the other regions of Andalusia, the area is pleasant as it is not overcrowded and prices are reasonable. Whether you want to sail at sunset and see the dolphins or enjoy a seafood paella on the beach, you can enjoy a beach day at 35 minutes from the city. 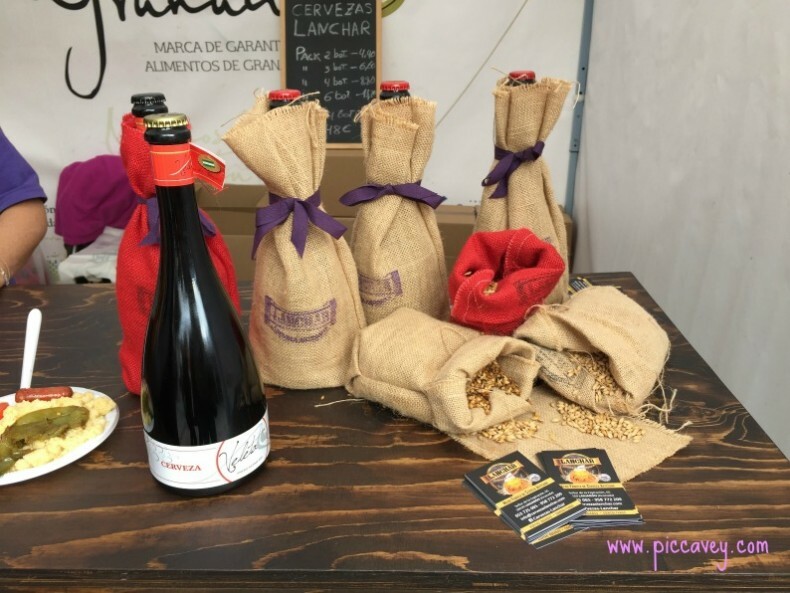 Over the last 5 years Craft Beer producers in Granada province have increased. Local beers are made with water from the Sierra Nevada Mountains and are infused with different flavours from the region. Lemons from Lecrin Valley, Rosemary from the mountain tracks or Chirimoya fruit from the Costa Tropical. Wine tastings are held in Granada showcasing local artisan producers by Spain Food Sherpas. 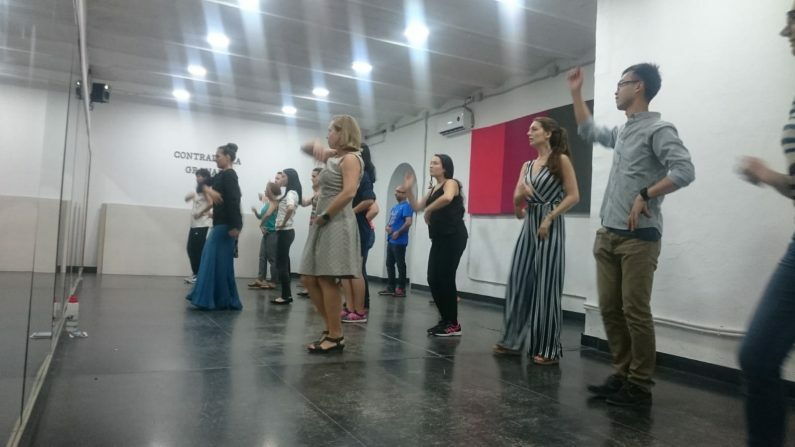 If you love Flamenco music Granada has some great dance schools where you can learn to play Cajon, Clap Flamenco Rhythms or get to grips with basic footwork. If you are a beginner or have already had some lessons, the teacher will adapt to your skill level. 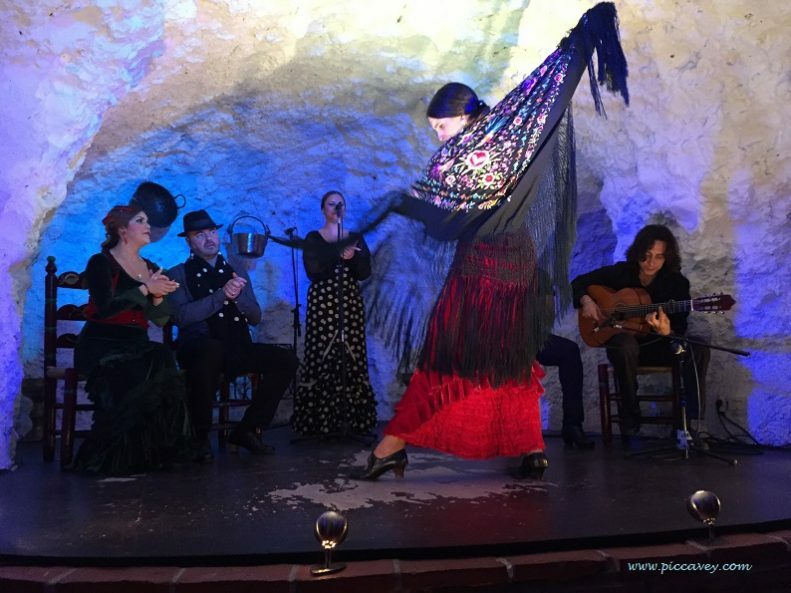 In Granada the most typical setting for Flamenco is the Sacromonte quarter or the Albaicin. You can see Flamenco more easily in Summer months as the festivals are then. Celebrated on the 3rd of May (and a few days either side of that date) this springtime festival is full of colour. A happy atmosphere livens up squares and patios around the city. Some of the areas have a license to have a street bar serving food and drink. It really is a fun festivity. 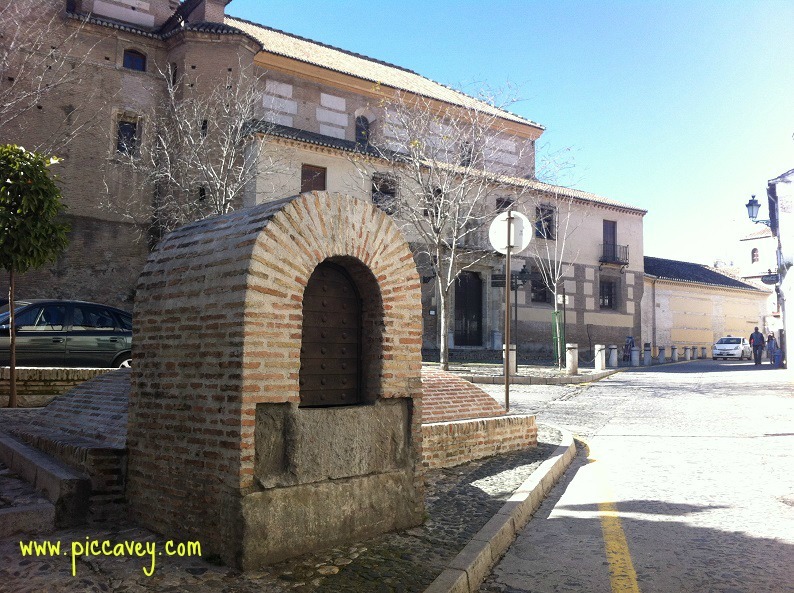 Granada is full of little squares and babbling fountains. It is a place to wander and explore. Leave your phone behind and lose yourself in the narrow alleys and the stepped streets. You will come to a square every now and then. Some have plantpots, oranges trees or small fountains. All of them will have charm. This is one of the highlights of Granada spending time outside on the street, watching the world go by. Some Spanish locations dont seem to have many cake shops or desserts to choose from. Granada isn´t one of the those. It is quite typical to have a city stroll in the afternoon as a family or with friends and stop for coffee and a cake. There are many cake shops or Pastelerias to choose from. Perhaps not that most obvious idea of Things to do Granada. However this is a good activity for families or visitors on a very hot day or rare rainy day. 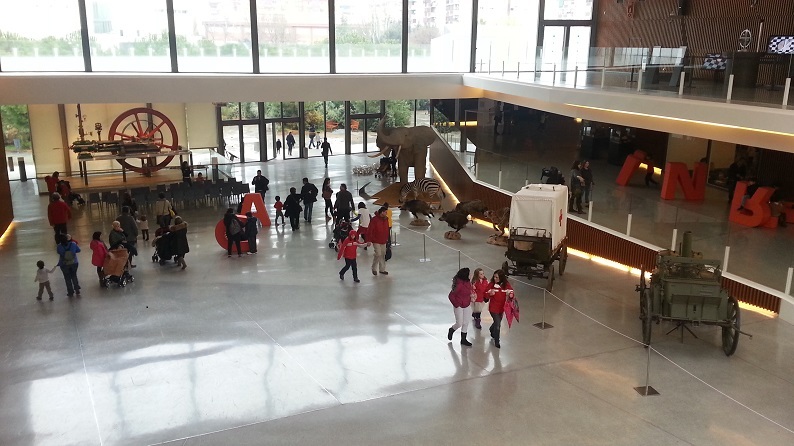 This museum is ideal for Children with its hands on DO TOUCH approach. Add to that its butterfly park, observation deck and temporary exhbitions. At the Palacio de Congresos or Teatro Isabel La Catolica there are often Musical or Theatre Productions to see. Some will of course be attractive to Spanish speakers, yet the musical programme would be of interest to any vistors. Also Opera and Ballet performances would also be a good option for visitors to Granada. Often prices here are lower than other European locations. When you arrive in the city check out the offer at the Corte Ingles (basement) or Theatre Ticket Office on Puerta Real. To find out the cultural listings in Granada is trickier as there is not one publication with all the details. So to discover more Things to do Granada I stick to these two venues as they have the most reliable information and ticket services. 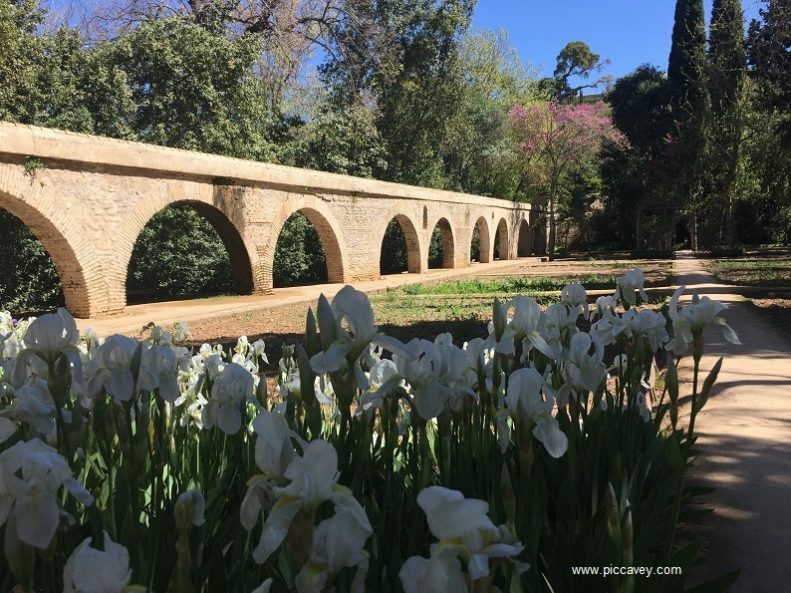 Walk along the River, whether you choose the Carrera del Darro with its Albaicin and Alhambra views, or wander along the Genil River which leads to the Sierra Nevada and Realejo quarter. A walk along the riverside is pleasant especially when temperatures are higher. Both riverbanks have plenty of cafés and bars too. Probably the most well known person from Granada is the Poet and Playwright Federico Garcia Lorca. 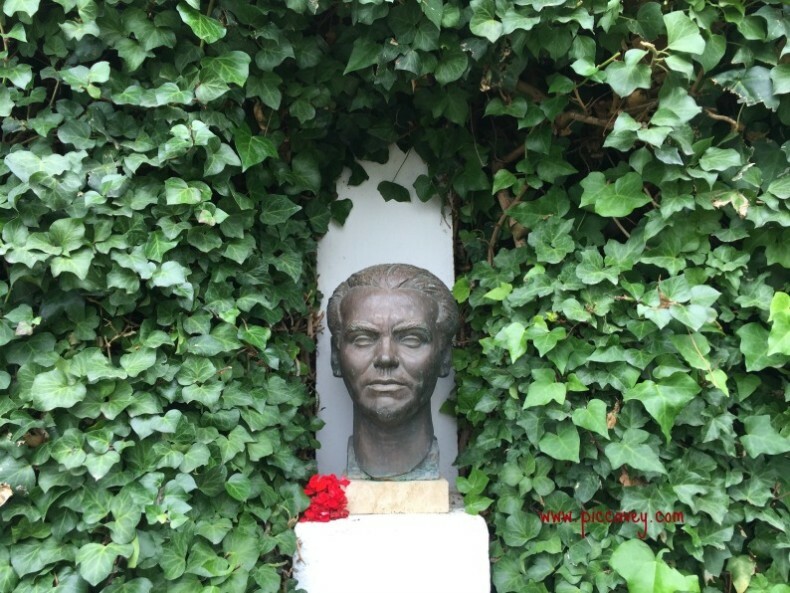 He has a centre dedicated to him on Plaza Romanilla but there are other places to visit to find out more about this important historic and literatary figure. 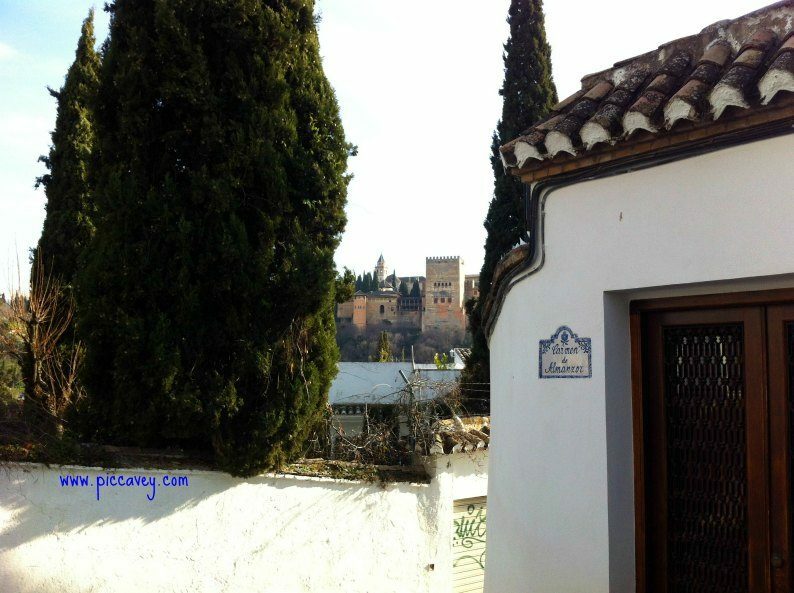 Although you may not be able to learn Spanish on a short stay in Granada. It is a place that you can improve or practice the language. Not many locals speak english so you will be thrown in a the deep end. If you have time perhaps you could go to an intercambio evening. A Language Exchange night, There are free events and tend to be in bars arond the city centre mid week in the early evenings. 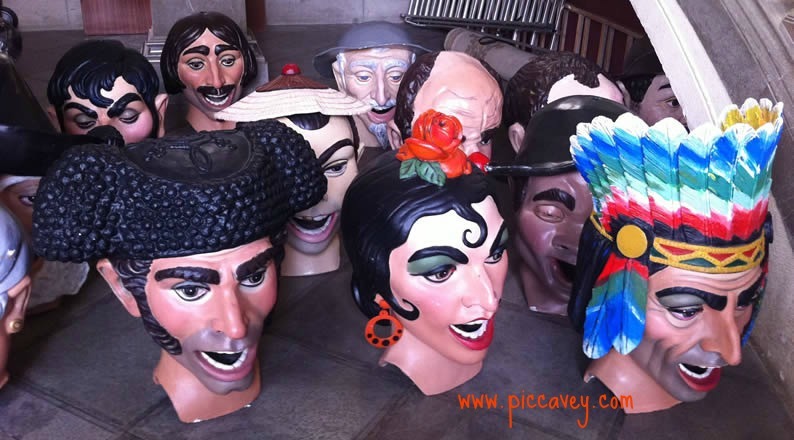 You can also choose to do an intensivo Spanish course in one of the local academies here. Even if you only learn a few more phrases when you come to Granada you will be taking some more Spanish words with you. This historic building just off Calle Reyes Catolicos is a impeccably preserved. This was the inn where merchants on the Silk trading routes would stay. A trading post, inn and warehouse all rolled into one back in medieval Granada. Built in the 14th century, now it is used for Flamenco shows in summertime and there are offices in some parts of the building. There is a tourist information desk here too. Granada is a very musical city as several prestigious musicians and composers have come from Granada over the centuries. There are plenty of classical music concerts and recitals to enjoy when you visit. Live Music can be enjoyed at the Manuel de Falla concert hall or even inside the Alhambra itself. In Summer the International Music and Dance Festival and Flamenco Programme are organised inside the monument itself. Check full programme on internet. The oldest building in Granada. It´s been there since the 11th century. El Bañuelo this is one of 12 bath houses which would have been in Granada in medieval times. Located next to the River Darro, close to Plaza Nueva, head there on Sundays to enjoy free admission. It is considered to be the best example of a building of its kind in Spain. The Route of the Dobla de Oro is a pass to see medieval homes in the lower Albaicin. Casa de Zafra, El Bañuelo and the Casa del Chapiz are included. In total there are six buildings which have been carefully restored. 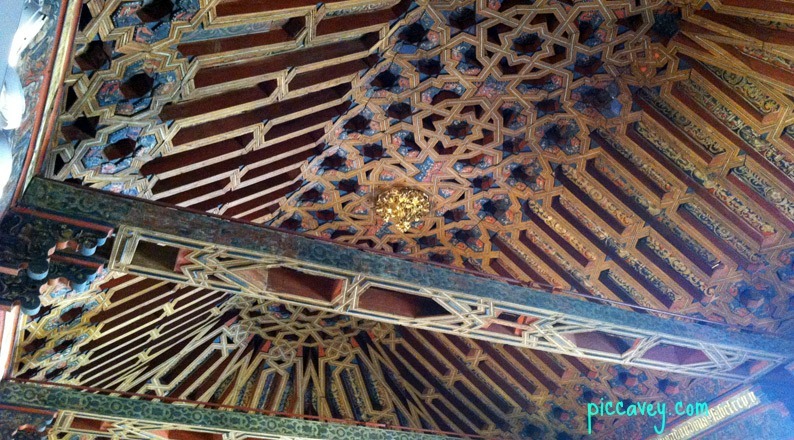 All six are excellent examples of the architectural style of Al Andalus. It shows us a window into the history of the city. With Granada being such a photogenic place you will have plenty of locations to get the perfect selfie. The quaint whitewashed streets of the Albayzin, the Generalife gardens and the beautiful tiles on the walls of the Alhambra palace all make great photos. Head off the main streets to find narrow plantpot filled alleys and stepped streets. Paseo de los Tristes is along another location with plenty of photo opportunities too. 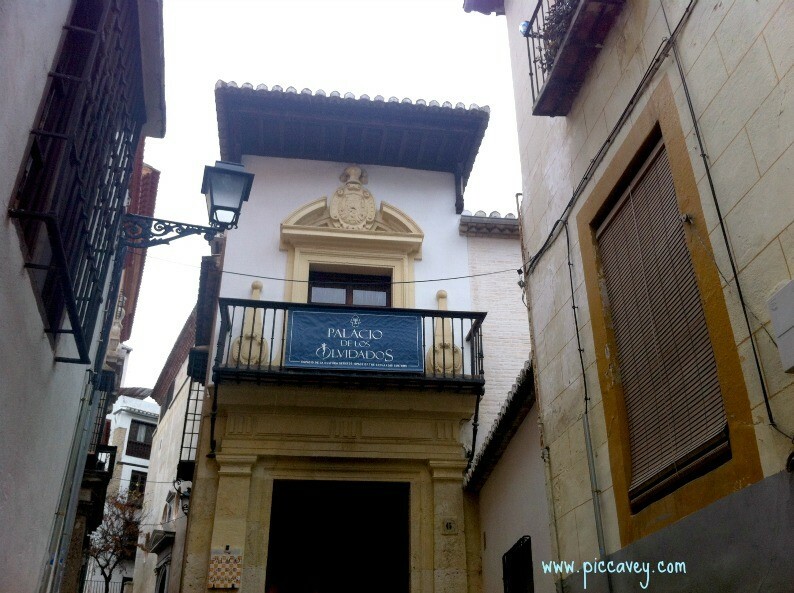 Located on the Calle Pavaneras this Museum has lots of information about the local festivals over the centuries. The 16th century building itself is worth visiting especially for the woodwork ceiling as you enter. La Cuadra Dorada has several faces set inside the carving of notable people at the time. With golden details it is a stunning design. In the rooms of the museum some of the exhibtions are temporary and some are permanent. It is free to go inside and takes about 1 hour to visit. 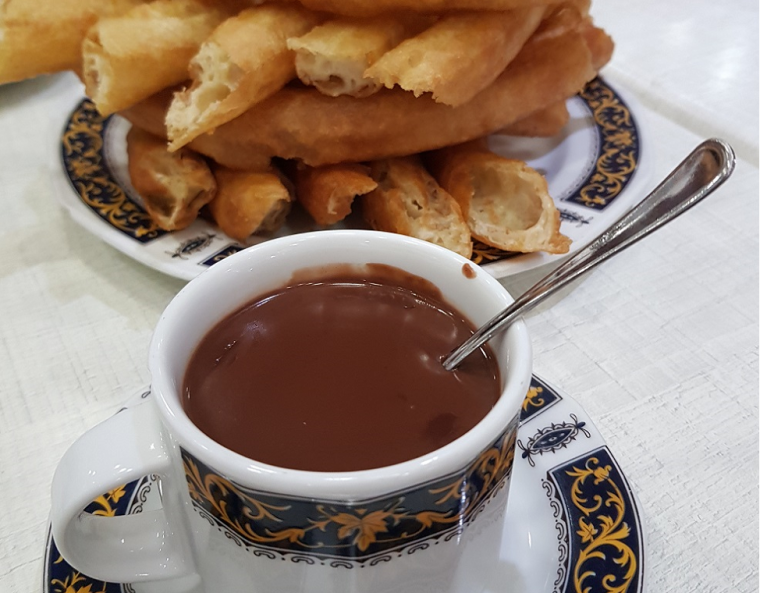 Usually for breakfast on Sundays or cold days, thick chocolate and fried churros are quite popular in Granada. There are lots of places to have them. One of my personal favourites is Café Futbol on Plaza Mariana Pineda. Locals also have them in the afternoon as a snack too. This Swimming pool is close to Atarfe on the outskirts of Granada. It is certainly a great option for hot days especially if you have children. The pool is filled up with natural spring water each morning. If you have limited time, have small children or don´t want to walk up hills the 32 bus route is a good option to see the city. The route goes into the Albaicin and also heads up to the Alhambra palace main entrance and then to the Gran Via area of the city. From March to September Gran Via is busy with crowds of people queuing for their Ice cream. 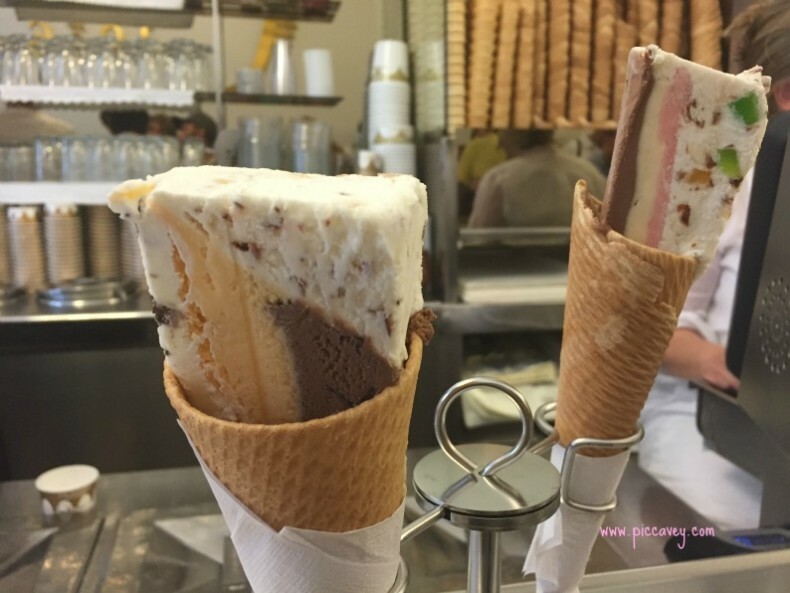 Los Italianos speciality is the Cassata (seen above) they also have others. Don´t be put off by the busy entrance, its part of the experience. You will get served it just make take a while. It will be worth it. The ice cream here is made by the team who have been in business for almost a century now. Set to one side of Bib Rambla Square the streets of the Alcaiceria were the old silk market. Next to the main mosque and Koranic university in Medieval Granada, this was the thriving centre of the city. Nowdays it is lined with small stands and shops selling Moroccan leather goods and small items. Such a colourful part of the city, its a joy to browse and buy a few items to take home with you. No trip to Granada is complete without a Mint tea. The main streets are Caldereria Vieja and Caldereria Nueva off Calle Elvira. (close to Plaza Nueva) although there are Tea houses in other parts of the city too. The Sacromonte Area of the city always captures the imagination of visitors. Lined with natural caves and prickly pear cactuses. This quarter is right opposite the Alhambra palace. This busy square is lined with cafés and next to the Cathedral. It is always lively with people as it is located in the main shopping area of the city. In the centre of the square the fountain depicting Neptune didnt used to be in the square it was added 100 years ago. It makes a good meeting point and it also the place for Christmas Markets and different festivities thought the year. 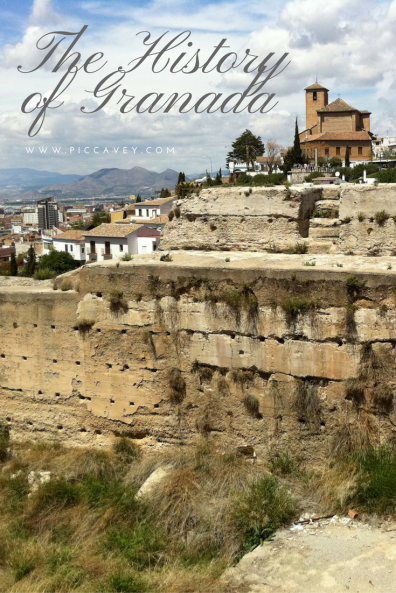 The Jewish history of Granada is perhaps not as well known as other cities such as Toledo or Girona. Palacio de los Olvidados just off Plaza Nueva is worth a visit.Inside there are different rooms sharing the sefardi past of the city. In Summer at there are concerts and events on in the evenings. 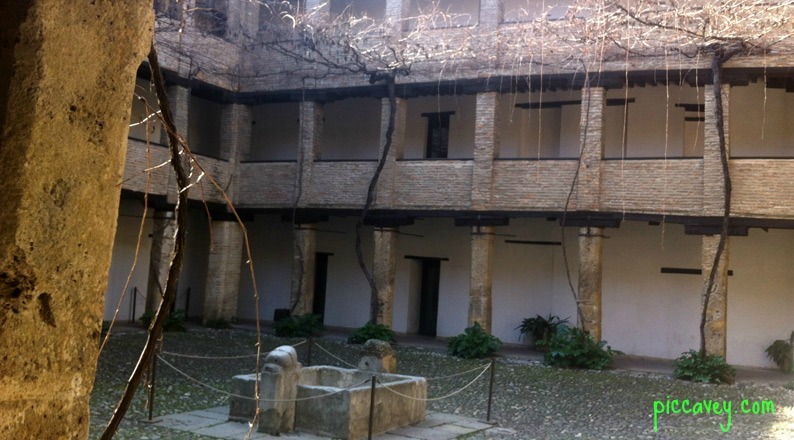 Another way to discover the history of Granada is to visit the Realejo, Jewish Quarter with a local guide or historian. Although the synagogue is no longer standing there are quite a few clues in this part of the city of its past. Inside the building you can visit the Instituo Gomez Moreno which has some interesting collections of art and curiosities collected from different countries. The main fair in Granada is celebrated in early June each year. Located close to the Bus station in the North of the city the main fairground has marquees set up with food and drink. There are also lots of stages set up for flamenco dancing and live music. Corpus Christi Fair lasts for over a week. In the city centre there is also a lively atmosphere with activities in Plaza Bib Rambla and Plaza del Carmen. 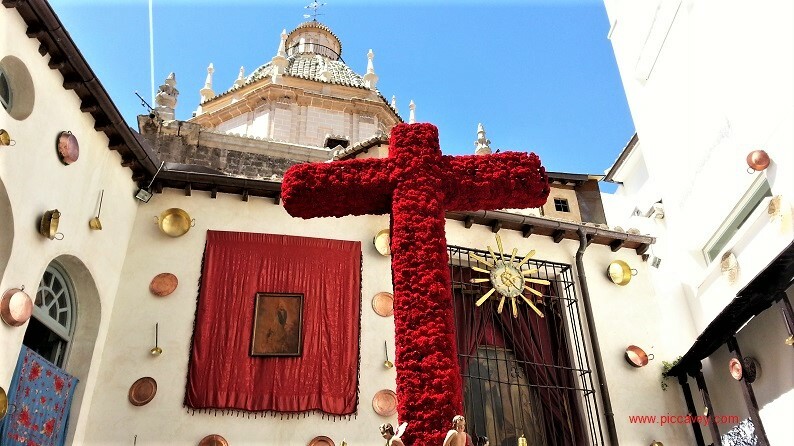 The parade known as La Tarasca is on the day of Corpus Christi and also the day before. Expect to see plenty of ladies wearing typical ruffled dresses and horses around the city centre. Shops are closed in the afternoons throughout the week of Corpus Fair in Granada. As this is the main reason for many visiting Granada I have left it until last. The beautiful gardens and intricate plasterwork is quite impressive. Easy to see why it is a UNESCO World Heritage site. Even though I have included fifty different things to do Granada, I may have skipped something. 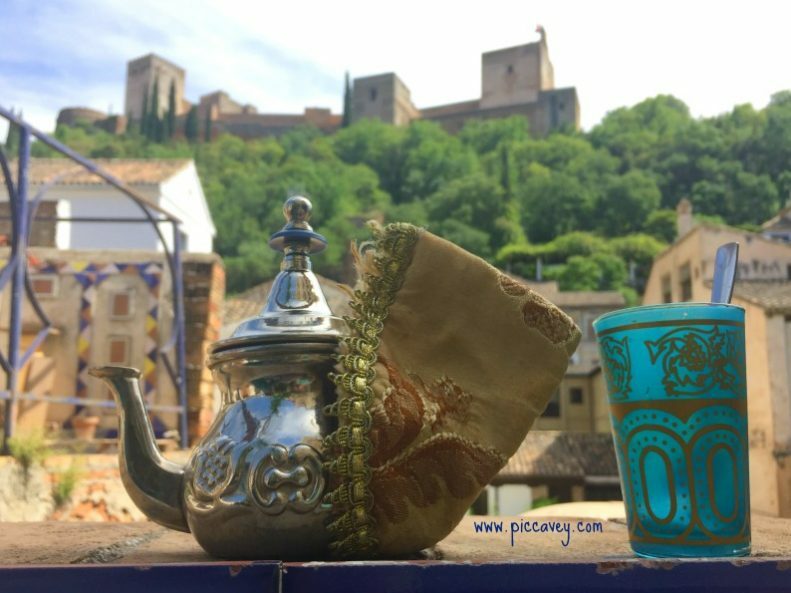 What would you take time to see in Granada, Spain? 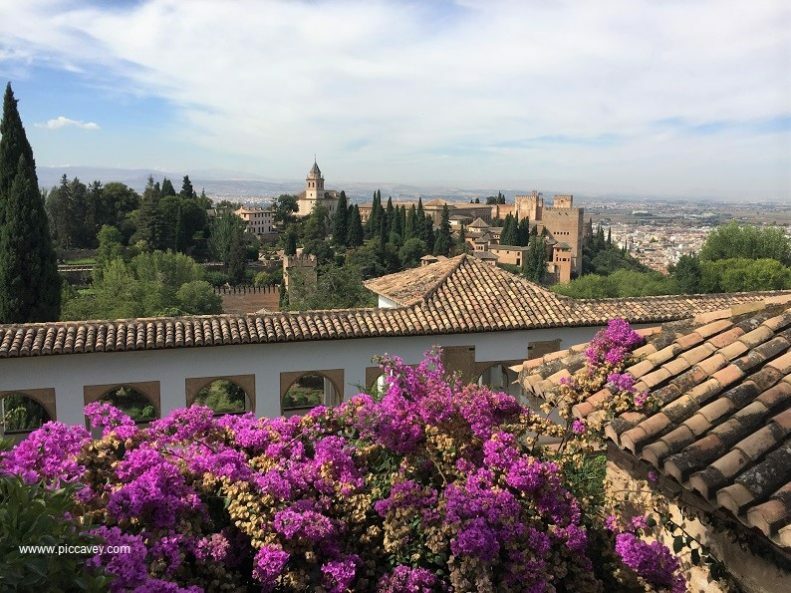 What a fabulous guide to Granada Molly, love the photo with the roses in the Squares and Fountains. 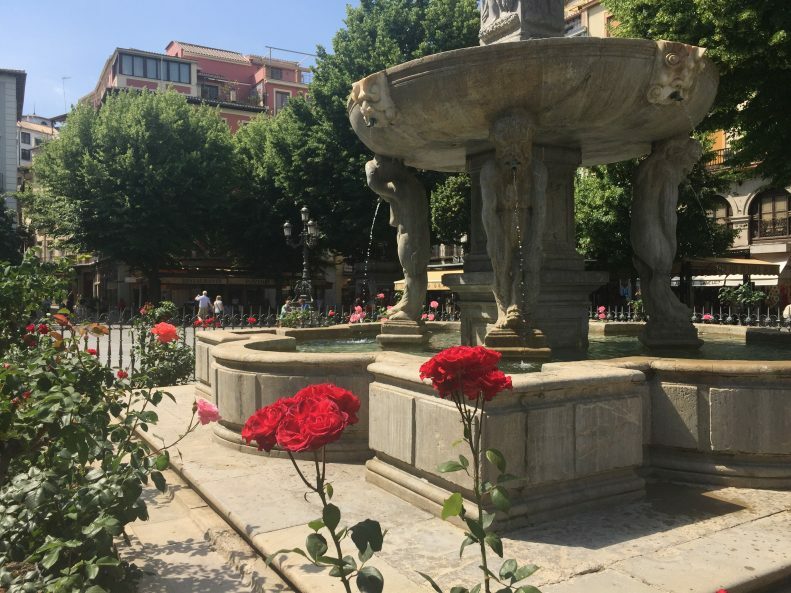 Are there roses in all the squares and can you visit any rose gardens in Granada? There are quite a few great places to see Roses in the city. The Generalife Gardens in the Alhambra Palace is a good example. Carmen de los Martires also has some great formal gardens too. Thank you Molly, would love to see some photos of the roses I bloom!